Christmas is the biggest holiday of the year and the most important time for many businesses. Retailers in particular. 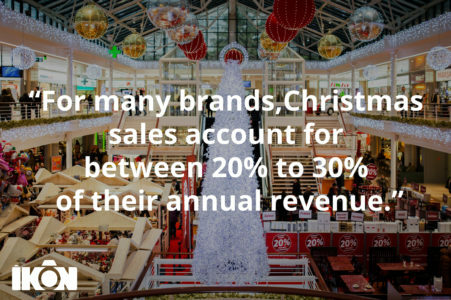 For many brands, Christmas sales account for between 20% to 30% of their annual revenue, but with every business battling for a slice of the consumer’s Christmas spend and with the season being a make or break time for practically anyone who sells anything, it’s no surprise that brands large and small throw everything they can behind their Christmas campaigns. 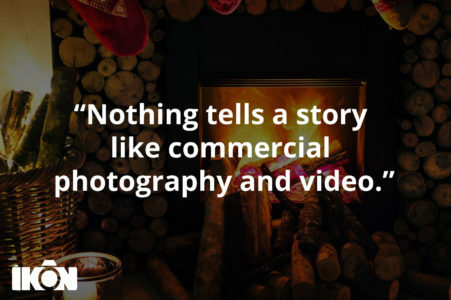 With this in mind don’t be a scrooge with your commercial photography & video! Christmas advertising is, unsurprisingly a hotly fought battleground and some of the biggest brands regularly create Christmas Marketing campaigns which go far beyond mere advertising and take their audiences on a festive journey. So much so that audiences actively seek out, share and discuss their Christmas campaigns. Christmas marketing has become an event in itself and something consumers look forward to seeing. 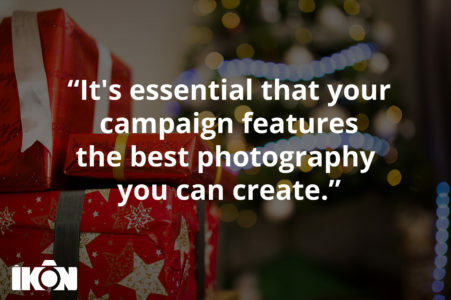 But what makes Christmas marketing so successful? 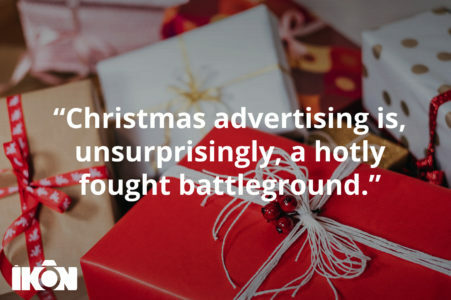 What makes a Christmas Advert? Any marketer worth their salt knows that storytelling is at the heart of successful marketing. While consumers may believe that they buy with their heads, in reality, it’s their hearts that have the final say. The decision to buy is usually an emotional one and Christmas is a time of year with some very specific emotional and sensory hooks on which to hang a clever marketing message. Ask someone what makes them ‘feel Christmassy’ and not only will they instantly understand the question, but will also most likely be able to tell you the very specific cue or cues which are most likely to invoke this feeling in them. Cues which are largely similar for many people and can be spotted time and time again in nearly every big brand Christmas Marketing campaign you encounter. Better still for brands and marketers, the gift-giving, feasting aspect of Christmas already hardwires consumers to loosen their purse strings, to let down their guard and to buy more than they would at any other time of the year. Marketers wanting to ensure they get their share of this buying bonanza would do well to include some of the following in their campaigns. In short, a successful festive brand marketing campaign involves making use of a combination of largely predictable ways to make your audience ‘Feel Christmassy’ by leveraging a combination of sensory and emotional cues. From the comforting, melodic solemnity of traditional Christmas Carols, the recognisable jingle of sleigh-bells, muted church bells and the magic musical chord combinations of G Major, E Minor, C Major and especially D Major which you’ll find used (in varying combinations) throughout most of the songs you’ll instantly recognise as Christmas songs. Music is well known as a mood changer and with the sounds of Christmas being so specific, our ears can be recruited to put us in the Christmas spirit through even the slightest exposure to any, or a combination of these aural cues. With its origins as a pagan midwinter celebration (which was later adopted and adapted by Christianity), the holly plant and feasting have been a part of Christmas before Christmas existed. Holly’s colours, red and green, were always part of this celebration and as such these colours used together often signify the festive season. Other aspects of winter, such as the sight falling snow, the comforting glow of a roaring fire and the imagery of families gathering around an opulent feast all hark back to the oldest visual associations with Christmas. More modern associations are no less powerful. The image of Santa is synonymous with the season, brightly wrapped gifts, coloured lights, lit candles, frosty windows all can be relied on to remind viewers of the festive season and as such feature prominently in Christmas campaigns. 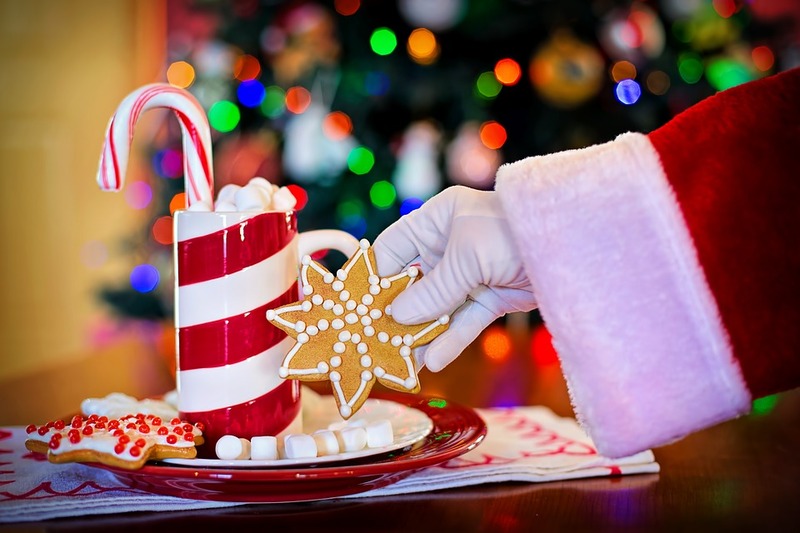 It will come as no surprise to know that the closely related olfactory senses of smell and taste aren’t left out when it comes to stimuli which can be associated with Christmas. Once again, the feasting side of the season provides a lot of this sensory input. At a time of year when families gather together, to eat more food than they normally would and to eat more grandly than they normally would, the smells and the tastes of this specially prepared seasonal banquet are very specific. Rich foods and rich spices which are largely only consumed at this time of year, combined with the scents of pine, smoke, cinnamon, ginger, cloves, oranges etc to create a combination of tastes and smells which are both pleasant and synonymous with Christmas. Christmas is a time of year for families and friends to come together and enjoy the company of one another. Indeed, it can often be the one time of year when large, scattered families regularly make an effort to visit one another and spend time together. The idea of these gatherings is often used in Christmas Marketing campaigns by brands in order to remind their audience of the happiness that they’ll feel surrounded by their loved ones at Christmas. It can also be used to point out the sadness of those who are not so blessed should it be appropriate to the campaign. Stirring emotion, any emotion is a sure way to make a marketing campaign memorable and nothing tells a story like commercial photography & video. Another key feature of the holiday season is a tradition. 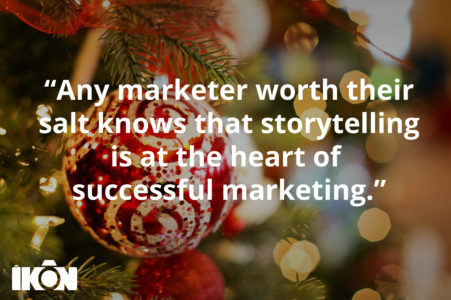 While storytelling is part of marketing, it’s also very much part of Christmas, so the two go together like turkey and stuffing. The types of stories told in Christmas Marketing campaigns often follow similar themes, referencing tradition or invoking nostalgia. As already mentioned, the age-old tradition of feasting with family during winter months is synonymous with the festive period. The ‘Christmas Story’ with its religious origins, steeped in tradition of its own and the ‘season of goodwill’ theme, where we’re reminded of those less fortunate than us, can be leveraged by marketers to make us feel happy for an ‘underdog’ character who either succeeds after a struggle or is cheered up by the kindness of others. New traditions are being invented and adopted all the time which can be referenced, leveraged and juxtaposed in marketing messages while still being able to invoke the Christmas Feeling in audiences. Even gently satirising Christmas traditions, adding a non-Christmassy twist to a festive message, or even adding a slight Christmassy twist to an otherwise unrelated message is enough to make an advertising message a Christmas message. Every year, some of the biggest brands create what can be regarded as masterpieces of advertising in an example of newly created Christmas ‘traditions’. So much so that these advertisements have almost become part of Christmas in that consumers actively seek them out and look forward to their release. Prime examples are the annual John Lewis Christmas campaigns and Marks & Spencer’s Christmas Campaigns, led by lavishly created TV advertising. With strong emotional cues, designed to pull at the heartstrings as well as promote the brand, these campaigns are memorable, emotional and eminently shareable. If ever there was an example of brand Christmas marketing hi-jacking the festive period, however, it’s the overwhelmingly successful story of Coca-Cola’s annexation of the holiday season. Many of us will have friends or family members who’ve said words to the effect that they don’t feel like Christmas has begun until they’ve seen the Coca-Cola Christmas Truck advert on TV, with its familiar ‘Holidays are Coming’ theme song (you’re probably thinking of it right now) along with a brightly lit lorries bearing the Coca-Cola logo. However, this isn’t the extent of how much Coca-Cola have changed Christmas to match their branding. Less well known, is that Santa Claus, the personification of Christmas, a large jolly man with a white beard and a red suit hasn’t always looked the way we know him today. Over 100 years ago, Santa might have been depicted variously as, tall, short, gaunt, elfin etc and rarely if ever wore red robes. Coca-Cola has used the image of Santa in their Christmas advertising since the 1920’s, but the instantly recognisable image of Santa we all know today was created by Coca-Cola themselves in 1931 and has since gone on to become the accepted image of Santa Claus ever since. 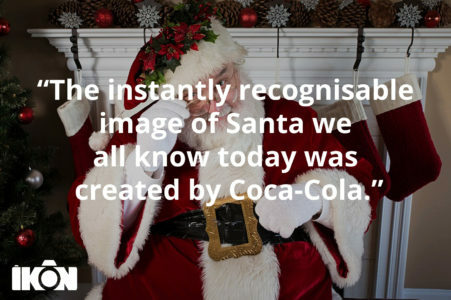 It may not have been planned that way, but Coca-Cola’s Santa is probably one of the most successful pieces of pervasive marketing ever created and a perfect example of how effective commercial photography & video can be. Just a touch of Christmas is enough to make a brand message festive, however, at the most fiercely competitive time of the year, brands large and small will pull out all the stops to make sure their marketing campaigns catch the attention of their audience. The stakes are high but so are the rewards to be had from succeeding. To stand any chance of winning your next Christmas marketing campaign, the usual rules of commercial photography & video apply. 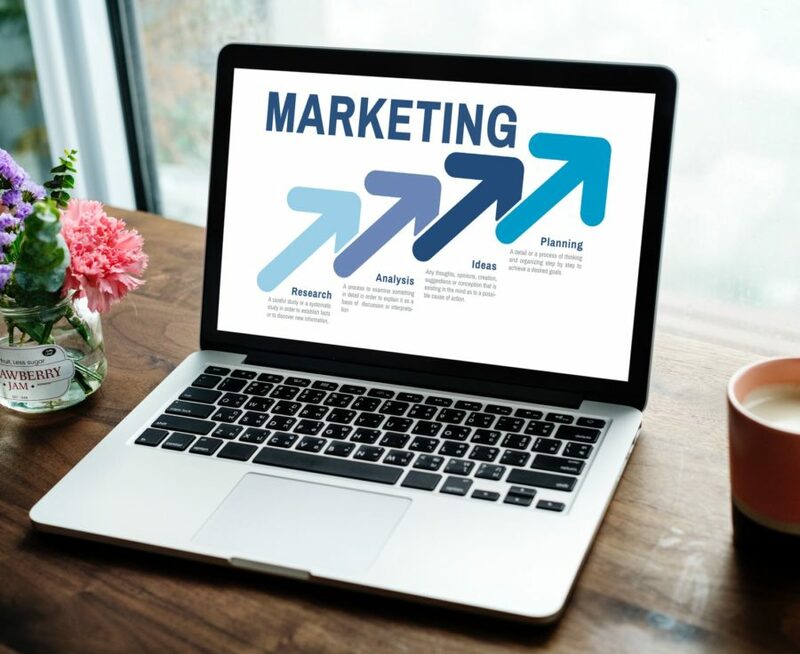 Your content must be visually appealing enough to catch your audiences eye, (at a time when they’re already surrounded and bombarded by eye-catching photography and video) and hold that attention long enough to deliver your message to them. With your brand’s visuals being so important, it’s essential that your campaign features the best photography you can create, or have created for you. At Ikon, we have decades of experience creating stunning commercial photography. Whether that’s product photography or broadcast quality brand videos, we have a cavernous studio at our disposal in which we regularly construct bespoke sets from scratch. Whether that be a cosy lounge to depict ‘the night before Christmas’ or a glistening white winter wonderland. Speak to us about getting the best brand and commercial photography, for the festive season and beyond, to make sure your brand has a very Merry Christmas and a prosperous New Year.